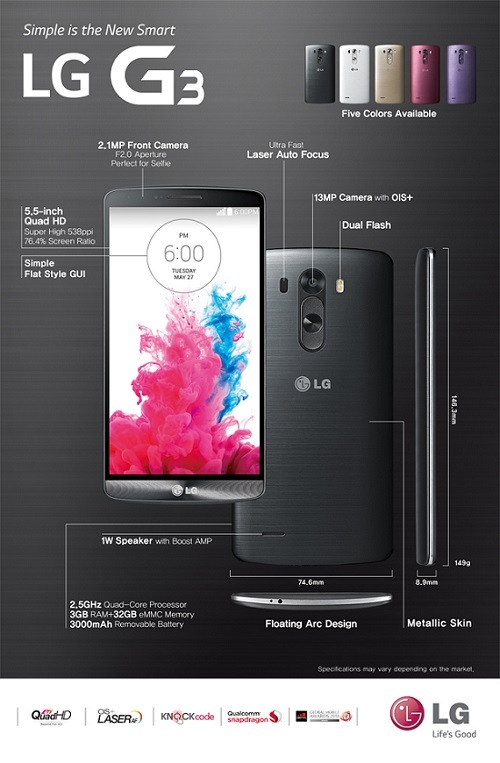 The LG G3. (Image: LG). LG has launched yet another premium smartphone to contend with the other high-end offerings on the market – the G3, touted as offering a simple user experience. Wrapped in a sleek, metallic skin covering the rear of the phone, it’s available in black, white, gold, violet, and burgundy red. The specs are as impressive as you’d expect from a high-end phone in an extremely competitive market, but LG has also tossed in the option for a removable battery (bonus), as well as the option for expandable memory with its microSD card slot. Its screen is also extremely sharp, with a Quad high-definition display (2560 x 1440) in-plane switching LCD screen, plus a pixel density of 538ppi. However, LG has also thrown some new features into the mix, like a more minimalistic user interface with flat graphics, as well as some user experience-related features like a Smart Keyboard. It predicts what users will type next based on the words they’ve inputted in the past. The keyboard also can be adjusted in height to work with a user’s hand size and thumb position. There’s also a personal assistant called Smart Notice, which gives users suggestions and recommendations based on their behaviour and location, similar to Apple’s Siri – for example, it can remind users about a call they didn’t take and it can ask them if they’d like to return the call. They also will point out unused files and apps that take up space and that users might want to delete. It also uses natural language to give users a heads up – for example, if it’s a rainy day, it might tell users to bring an umbrella as it will rain in the evening, as opposed to just showing them the weather forecast. And while the LG G3 doesn’t come with a biometric fingerprint lock, it does have other ways of providing security. To unlock the phone, users can tap anywhere on the screen with a special pattern called a Knock Code. There’s also a feature called Content Lock, which will put personal files out of sight – for example, if a user was showing a friend or co-worker something on the phone, those personal files wouldn’t be visible, nor would they be available as a file preview when connected to a PC. Then there’s the Kill Switch feature, which allows users to remotely disable their phones if they were lost or stolen. The feature can also wipe content so that personal data doesn’t fall into the wrong hands. It also comes with anti-virus scanning. There’s no confirmed date as to when the LG G3 will land in Canada, or how much it will cost, an LG spokesperson said by email. However, the phone is set to be released in South Korea on May 28, and another 170 carriers worldwide will be receiving it afterwards.